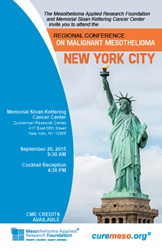 On September 26, the Mesothelioma Applied Research Foundation (Meso Foundation) will be the co-host, along with Memorial Sloan Kettering Cancer Center, of its third regional conference taking place in New York City, geared to the general public as well as medical professionals. Registration is $25 per person (includes all sessions, breakfast and lunch). Registration is available online on the Meso Foundation’s website at www.curemeso.org/ny15 or by calling the Meso Foundation at (703) 879-3797. Availability is limited. The 2015 New York Regional Conference on Malignant Mesothelioma is a one-day event geared to patients and family members, medical professionals, and researchers, covering a variety of topics related to mesothelioma and presented by local and regional mesothelioma experts. The conference is a collaborative effort between the Mesothelioma Applied Research Foundation and Memorial Sloan Kettering Cancer Center. Sessions will include presentations on most up-to-date research behind surgery, chemotherapy, immunotherapy, radiation oncology, and pleural and peritoneal mesothelioma. The event will be held on September 26, starting at 9:30 AM at Memorial Sloan Kettering Cancer Center, Zuckerman Research Center, 417 East 68th Street, New York, NY 10065. Medical professionals attending the conference are eligible for CME credits. Sessions include in depth information about pleural and peritoneal mesothelioma, surgery, chemotherapy, immunotherapy, and radiation oncology. Ken Rosenzweig, MD, Mount Sinai Hospital. Registration is $25 per person (includes all sessions, breakfast and lunch). Registration is available online on the Meso Foundation’s website at http://www.curemeso.org/ny15 or by calling the Meso Foundation at (703) 879-3797. Availability is limited. The event is co-chaired by Mary Hesdorffer, APRN, nurse practitioner and executive director of the Mesothelioma Applied Research Foundation, and by Valerie Rusch, MD, of Memorial Sloan Kettering Cancer Center. Ms. Hesdorffer is an expert in the development and implementation of clinical trials for mesothelioma and her work has been published in a variety of scientific journals. Dr. Rusch is Vice Chair of Clinical Research for the Department of Surgery at Memorial Sloan Kettering Cancer Center in New York, where she also holds the Miner Family Chair in Intrathoracic Cancers. Mesothelioma is a malignant tumor of the lining of the lung, abdomen, or heart known to be caused by exposure to asbestos. Medical experts consider it one of the most aggressive and deadly of all cancers. An estimated one-third of those who develop mesothelioma were exposed while serving in the Navy or working in shipyards. The Meso Foundation is the only 501(c)3 non-profit organization dedicated to eradicating mesothelioma and easing the suffering caused by this cancer. The Meso Foundation actively seeks philanthropic support to fund peer-reviewed mesothelioma research; provide patient support services and education; and advocate Congress for increased federal funding for mesothelioma research. The Meso Foundation is the only non-government funder of peer reviewed scientific research to establish effective treatments for mesothelioma and, ultimately, a cure for this extremely aggressive cancer. To date, the Foundation has awarded over $9 million to research. More information is available at http://www.curemeso.org.